InertCap Chiramix is a specialized column for optical isomer analyses. It is coated with a mixture of more than two kinds of cyclodextrin derivatives. 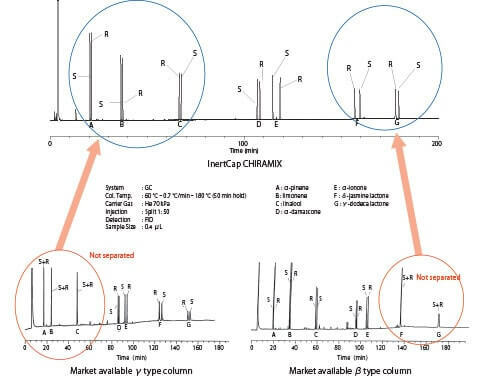 Compared to existing columns that is coated by only one kind of cyclodextrin derivatives, InertCap Chiramix can effectively analyze wider range of compounds in a short time. It is the first choice for optical isomer analyses.